Badolo is a hamlet located near the village of Sasso Marconi in the province of Bologna. 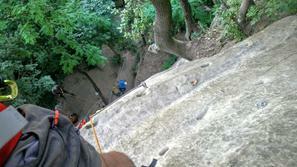 It is better known among climbers as the Rocca di Badolo. 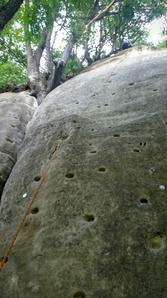 The climbing gym of the Bolognese has been for decades. Tiziano Nannuzzi called it a wonderful sand castle, because on these sandstones they learned to climb (and to dream) thousands of people of all ages coming from Bologna, but not only, during hundreds of courses. Every day of the year on these walls climb hundreds of kids. It would be long, perhaps impossible, to tell the sporting history of these rocks and the secrets of each of these routes. The fact is that this is the largest and most free sports facility for Bolognese climbers. The climbing part is about 120 meters high and is divided into four large sectors: Badolo Basso, Medio, Alto and New. In each area you can find routes for all tastes and difficulties. Access: Badolo can be reached from Bologna in about 30 minutes. For those arriving on the motorway it is advisable to exit the A1 at Sasso Marconi, immediately taking the SS-325 to the left. For those coming from the south or from Padua A13, once you reach the ring road, follow the directions for Casalecchio di Reno up to the exit. Continuing then towards Sasso Marconi SS-64 Porrettana you reach after 16 km at the above mentioned village. At the exit of the latter turn left, for the SS-325. Continue for about 4 km. Turning left at the sign for Badolo - Monte Adone, a series of hairpin bends lead easily a few minutes from the wall. Not to annoy the private property is not recommended to park at the last bend, point closer to the wall, but to do it on the right 400m ahead, or in the square of the Church. Exposure: Climbing all year. Not recommended after long periods of rain. In the morning it is in the shade. Gear: In the rock, nails of craftsmanship have been inserted into the rock, with a long stem of 14 to 18 cm and a diameter of 12 mm, which guarantee the seal in any situation. Most of the itineraries can be covered in moulinettes (the 60 m rope is recommended). Rock: Rock: sandstone (sand). At first sight the rock does not seem certain of the best species, however, after a couple of climbs, you gain confidence and confidence in climbing this "sand castle". Biblio: Further information is contained in the guide: "Climbing in Badolo" by Sandro Dal Pozzo and Lorenzo Finotti.